Getting to the roof of your van can be a difficult and unsafe task, especially on the new higher roof vehicles. 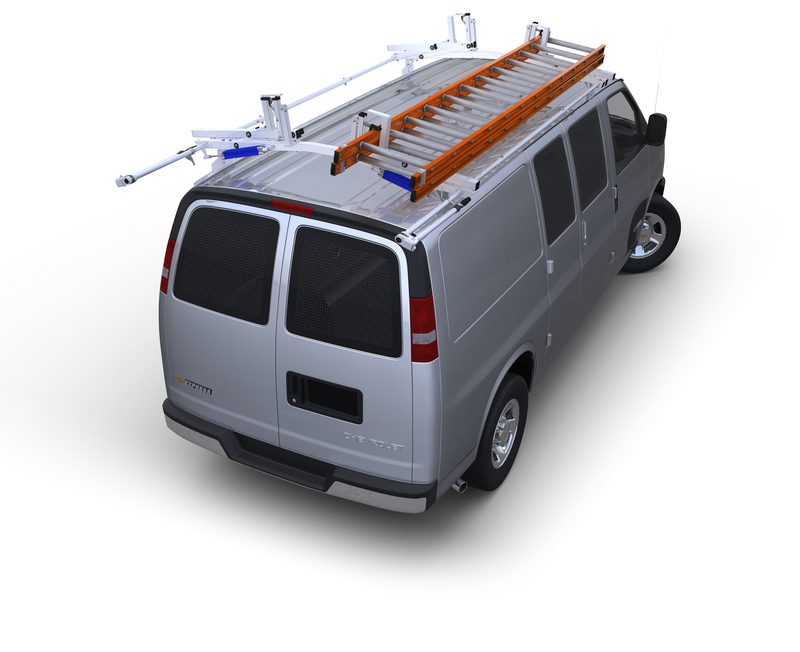 If you need to carry ladders or any other type of cargo on your roof rack, you’ll find these new Heavy Duty Aluminum Van Ladders provide the optimum safety for loading and unloading. These commercial grade ladders are constructed from durable yet lightweight 6005-T6, 6061-T6 compatible aircraft grade aluminum alloy. No drilling required - Installs in minutes! 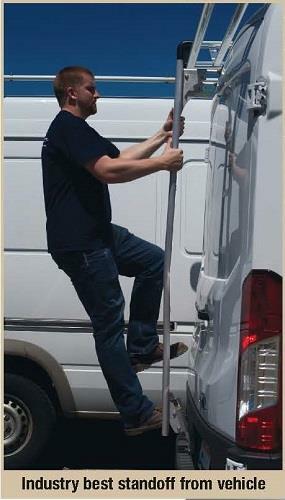 Getting to the roof of your van can be a difficult and unsafe task, especially on the new higher roof vehicles. If you need to carry ladders or any other type of cargo on your roof rack, you’ll find these new Heavy Duty Aluminum Van Ladders provide the optimum safety for loading and unloading. These commercial grade ladders are constructed from durable yet lightweight 6005-T6, 6061-T6 compatible aircraft grade aluminum alloy. Padded mounting attachments at the top and bottom of the Driver’s side rear door adjust to perfectly fit your vehicle for a safe and stable installation all without ever drilling in to your vehicle. Non-slip, square surface steps with an industry best standoff from the vehicle provide spacious and safe footing when climbing. Models are available for Transit low, medium and high roof, ProMaster low and high roof, Sprinter standard and high roof, Nissan NV standard and high roof and Chevy/GMC standard height vans. Not available for 2006 & Older Sprinter. Please specify make, model and roof height of vehicle from the selections above.